"Where a budding future starts, with a little Graft Craft"
Since its launch, the Scionon website has proven to be popular with those interested in propagation. We have also now achieved over 1,000,000 views on our YouTube channel, so thank you to all who have visited us to achieve this milestone. Recently several new features have been added to the website to enhance our visitor's experiences. We thank you for your continued support and use of this site. Please visit us again soon - we have more changes planned. 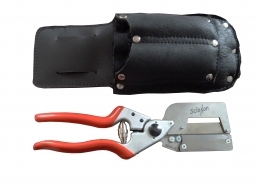 SCIONON grafting tools are an original concept in the approach to grafting. Since their introdution in 2009, our unique innovative designs have lead the way, having won many awards. 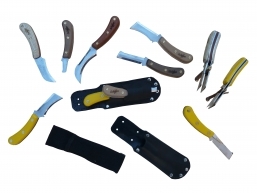 These versatile multi-functional grafting tools are extremely durable, being made from high quality materials and are still leaders today. The hand held SCIONON® Grafting Shears™ are an extremely versatile tool allowing unskilled persons to prepare at least 6 graft types safely and easily in the 3mm to 19mm diameter range. 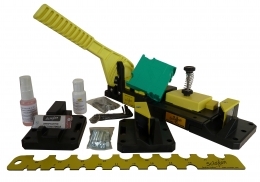 With minimal training and practice SCIONON® modular bench grafting tools will enable the novice or experienced grafter to prepare the following grafts - rind, whip & tongue, cleft & wedge grafts - in material between 5mm to 25mm in diameter. Easily prepare graft wood up to 15mm in diameter. SCIONON® grafting knives are most suited to preparing grafts safely and easily in small to medium scion wood diameters. Hi Ian, The shears arrived yesterday and Nathan has found his new best friend in them. Thanks for keeping in touch, excellent customer service.